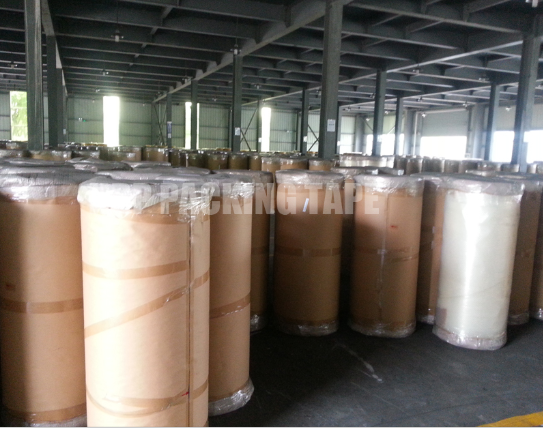 Self Adhesive Tape Jumbo Roll Supplier says that the quality of the tape is very important. Some tapes may break, because the break will affect the use of the tape. The reason for the tape breakage is that it has been damaged. When we used the tape, because the tape was thin, we didn't mark it after using it, so we couldn't find the interface when we used it again. Some people are more anxious to use, so they will use a knife to cut in the middle of the tape. At this time, because the scratches are deep, there will be a lot of multi-layer tape scratching. We are also inconvenient when using it. The second is to avoid the tip or sharp object contact with the tape when unpacking the tape. In addition, the tape cannot be in contact with sharp objects when in use, because the BOPP Adhesive Tape Jumbo Roll is very fragile and there is a risk of damage after contact with sharp objects. If you find that the tape is very easy to break at the same position when using the tape, it proves that the tape has been damaged. I hope everyone can pay attention to it when using it. Previous: What Are The Principles Of Using Best Shipping Tape?